"The world is a book and those who do not travel read only one page." St. Augustine was well known for his influential quotes and this one speaks to many, especially with the summer travel season upon us. Travel inspires us, excites us, brings us closer to the ones we love, and farther from the things that makes us worry. St. Augustine knew something very important back in the times of the Ancient Romans, even when traveling to exotic locales was not by any means a norm. He knew that the world was a vast place and to see it first hand, a necessity. One study that was recently published by the International Society for Quality-of-Life Studies shows that travel actually does enrich our lives, that those who wander are happier than those who do not. Anyone that plans a trip knows that not only is the actual vacation exciting, the anticipation of the get-away is also thrilling and the study shows just that. It suggests a relaxing vacation not only can make the soul sing during the duration of the trip, but that a vacationers' joy is elevated for weeks, if not months, before the trip actually takes place. With this knowledge, consumers are seeking the assistance of travel professionals to help them create a trip that will ensure a state of absolute bliss. The American Society of Travel Agents is ready and willing to help consumers to connect with a knowledgeable travel professional. If you are not currently a member of ASTA, now is the perfect time to join. Be ready to be a part of something incredible. Go to www.asta.org and learn everything you need to know to become the future in travel. When something turns 100 years old, it is almost always a good thing. Because let's face it, if anything makes it to 100 that is pretty impressive, regardless of whether it's a person, a building or an antique trinket. But rarely are the things that turn 100 still as fresh and new as the day they were created. When this occurs, it is a true miracle. There is one hotel in Switzerland that did just that, turned 100 and still manages to turn heads. Gstaad Palace opened it's doors on December 8, 1913 in the city with the same name. Gstaad the city, is one of Europe's favorite winter sports locations, and the hotel welcomes guests looking for some winter and summertime fun. 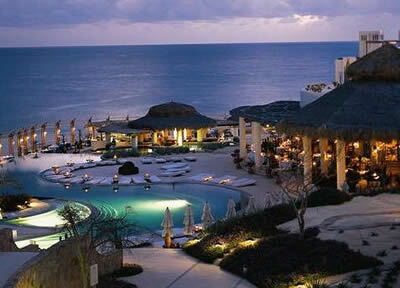 This year round resort is considered a bit traditional but the amenities are absolutely modern. The lighted tennis courts, an Olympic sized pool, state-or-the-art fitness facility, saunas, massage rooms all cater to those traveling here that enjoy an active lifestyle. Gstaad Palace even offers guests hundreds of miles of hiking and biking trails that wind through the lovely Bernese Alps that hug the hotel grounds. 104 elegantly decorated rooms welcome guests and the five on-site restaurants delight with traditional Swiss dishes, grilled specialties and even some Italian favorites. The lobby bar is relaxing and tasteful or have a drink in style at the Bar du Grill. If you are in the mood for drinks and dancing, head to the famous GoGreen nightclub that promises a spectacular time. The spa showcases top-notch treatments and the indoor and outdoor pool promise the perfect chance to enjoy the water no matter what time of year you visit. Other fabulous activities in the area that are perfect for the adventure seekers include heli-skiing and hot-air balloon rides. The Gstaad Palace is a resort that may be housed inside a gorgeous old-world building, but its personality and charisma are anything but archaic. Nestled at the foot of the majestic Alps in the stunning country of Switzerland sits the white beauty that is Gstaad Palace. With a 100 year old birthday approaching, this classic stunner stands proud. 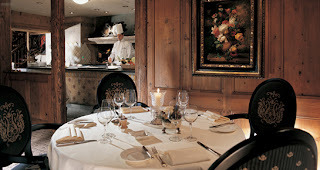 The years have been good to Gstaad Palace, earning it a reputation of unrivaled hospitality and comfortably welcoming international clientele. Let WhatAHotel! 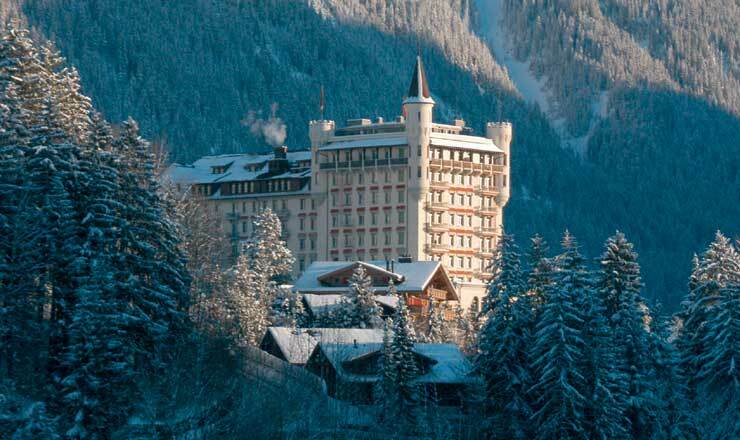 book your stay at the breathtaking Gstaad Palace and not only will you stay in this remarkable resort, you will also receive exclusive complimentary perks and benefits that are truly fit for a king. California has a huge number of fabulous cities and beaches that call to tourists. The great weather, laid back attitude and wide variety of ways to spend your time here all make it a perfect place for almost everyone. We have most likely heard of Orange County in Southern California, one of the most populated counties in California known for its affluence, conservative people and famed tourist attractions. But one city in Orange County with stunning coastal shores, fabulous surfing and a beautiful harbor may not be quite as well known, at least by its name. 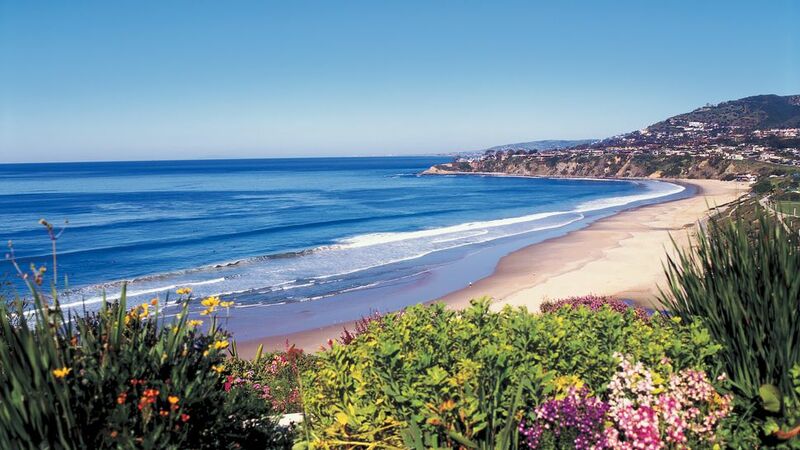 Dana Point, California is simply beautiful and the seven miles of pristine beachfront will ensure that you never forget your time here. Rolling hills, coastal bluffs and pretty beaches that are kisses by the waters of the Pacific are all found in dazzling Dana Point. The harbor here is impressive with over 2,500 slips and moorings for boats and more then 50 shops and restaurants to entertain guests. So whether you arrive by land or by sea, the harbor can accommodate all of your needs. Other attractions in Dana Point include some chic shopping, sport fishing, biking, hiking and of course water activities. As with most California communities, there is golf available at the Monarch Beach Golf Links or hit the open waters for some whale watching. If you are around on a Saturday, check out the Farmers Market located in La Plaza Park where you can purchase locally grown produse. 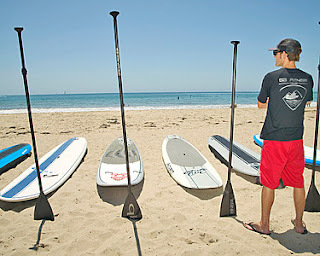 Dana Point has an activity for everyone from the romantic couple to the family of five. When planning your time in here, WhatAHotel! 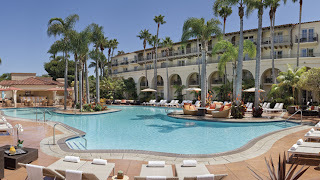 would love to assist you in booking your stay at either of these Best Hotels in Dana Point. First there is the Forbes Five-Star, AAA Five-Diamond resort, St. Regis Monarch Beach. This massive resort has also been voted "Top 25 Hotel Spas in the World" by Travel and Leisure. There is no doubt a stay here will be epic. The highly ranked on-site golf course is perfect for those in love with the links and the kids club will ensure your little ones have a great time while mom enjoys a little pampering at the spa. Stay in the luxurious suites and enjoy personalized service and amazing amenities. This hotel will definitely make it difficult to ever leave the grounds to explore all the great things to do in Orange County and Southern California. 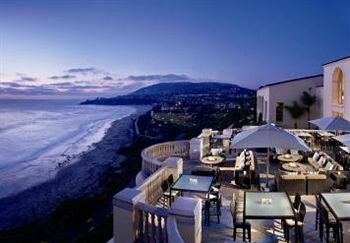 Not to be outdone, The Ritz-Carlton, Laguna Nigual is one of the world's finest resorts. Luxury can be found at this striking oceanfront setting. 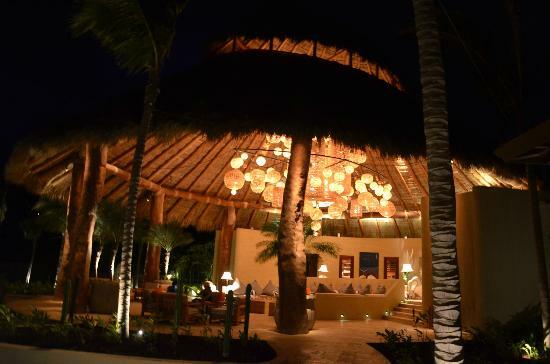 The spa is remarkable and the innovative cuisine offered at the restaurants is divine. Striving to provide elegance as well as an environmentally conscience experience, Ritz-Carlton, Laguna Nigual will not disappoint. Book your stay at either of these fantastic resorts and receive exclusive complimentary perks and benefits that will make your trip just a bit more perfect. Southern California and Orange County are both great locations for vacationers. 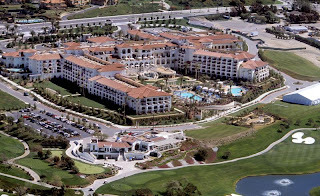 Stay at either of the amazing resorts, St. Regis Monarch Beach or The Ritz-Carlton, Laguna Nigual, and the vacation immediately becomes phenomenal. Head to the place where rolling hills, steep bluffs, peaceful waters and perfect beaches welcome you with open arms. In recent years, travel restrictions have become much more strict. Passports have become almost a necessity for every American, especially if you plan to head to some tropical paradise. If you are in need of a quick vacation but do not have your passport current, you are not out of luck. The United States has a few locales right in our own backyard, that promise upon arrival you will feel a million miles away. The first destination that pops into mind has to be Hawaii. Yes this island chain is an actual state, so of course it falls into the category of not requiring a passport. But with its rich culture and isolated location it is definitely worth a shout out in this article. This state is absolutely the most exotic out of all 50 and calls to travelers of every kind. Honeymooners, romantics, adventure seekers and families all love the island group for its diversity and depth. Let WhatAHotel! help you find out which Hawaiian Island best fits your vacation needs and pack your bags. Passport not required. The next location that doesn't require a passport is Puerto Rico. Considered an unincorporated territory, this Caribbean paradise is favorite travel destination for many Americans. Inexpensive airfare from many of the top airlines only adds to Puerto Rico's draw. This vacation destination offers guests a culture of delicious foods, friendly people and impressive history. 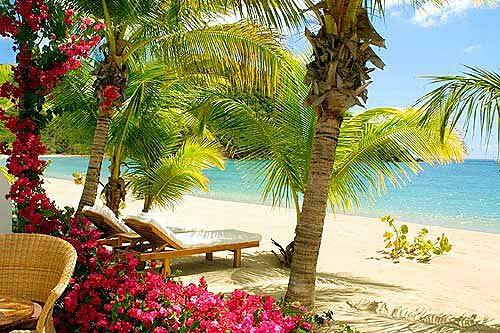 The resorts and hotels in Puerto Rico are luxurious and promise impeccable service and abundant amenities. 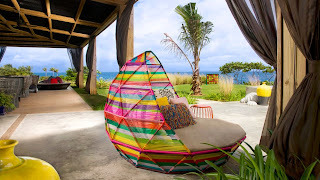 But if you are searching for a truly unforgettable destination, head to the stunning resort on the island of Vieques. The W Retreat and Spa Vieques is a secluded Puerto Rican paradise that has a bio-luminescent bay. Swimming in clear waters that glow with light will prove fabulous, but the W Retreat and Spa Vieques also pampers guests with a top-notch spa, exquisite cuisine and abundant adventure. Head to Puerto Rico for a little rest, relaxation and a reprieve from the ordinary. Our last spotlight location with an exotic edge, but no passport required, is the spectacular US Virgin Islands. Situated near Puerto Rico, this group of islands is made up of three main sites; St. Thomas, St. Croix and St. John in conjunction with some smaller islands. The entire US Virgin Islands group draws over 2.6 million tourists every year. St. John is full of national parkland and spectacular diving while St. Thomas impresses with boutiques, jewelers and a bustling cruise line business. 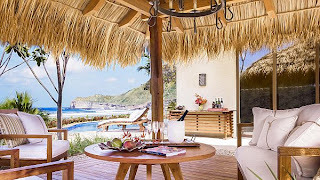 St. Thomas Ritz Carlton is newly renovated and overlooks the turquoise waters and pristine beaches on St. Thomas. 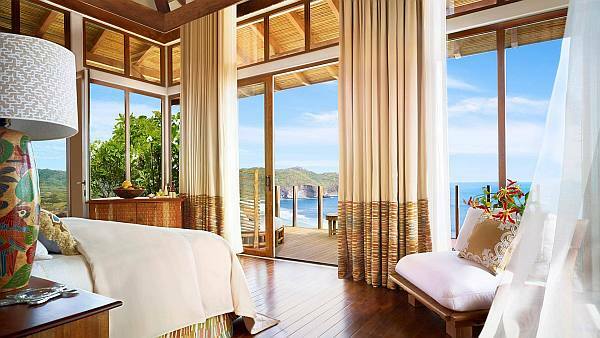 St. John has two exclusive resorts, Caneel Bay, A Rosewood Resort and The Westin St. John Resort and Villas. Both will not disappoint with chic decor, stunning views and low-key luxury. If the US Virgin Islands sounds like the perfect place for you, let WhatAHotel! 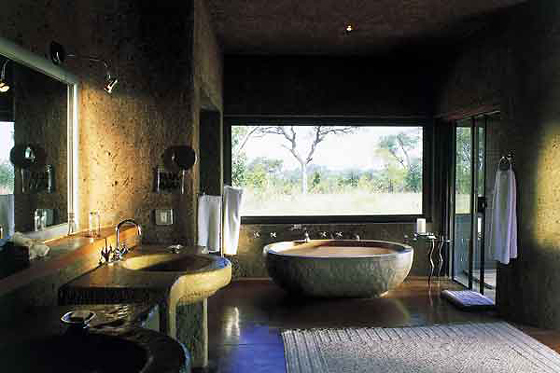 assist you in booking your stay in one of these remarkable resorts. These three astonishing locations are all easily accessible yet quite exotic vacation destinations. Luxury, culture, and let's not forget a pretty fabulous climate, all await you. So if you find yourself in desperate need of a vacation, these destinations are ready to welcome you, passport or no passport. Let WhatAHotel! find the resort that best fits your vacation needs and book your adventure with us. The Fourth of July is a great time for families and friends to gather together and celebrate our freedom. This is also a peak travel time for many, offices shut down and schools are closed making it the perfect time to get away. America the beautiful is ready to welcome you to join in on some fun summer festivities, so let's look at the coastal cities around the country with great parties already planned. San Francisco is known for the Golden Gate Bridge, warm and comfortable temps and let's not forget a great location. For the Fourth the city pulls out all of the stops and celebrates on the waterfront. On Pier 39 locales and tourists alike can find live music, shopping, yummy food and of course fireworks set off at around 9:30 local time. 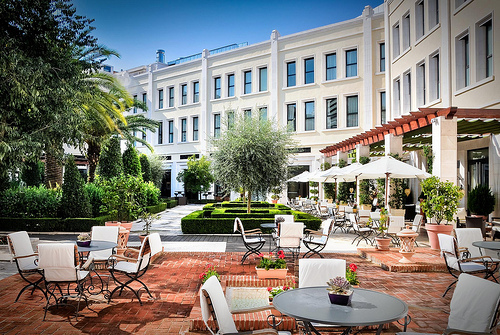 Stay at one of the Best Hotels in San Francisco and pack a blanket so that you can sit on the lawn and enjoy a great day waterside. Chicago, Illinois is located in the heartland and promises a spectacular celebration. 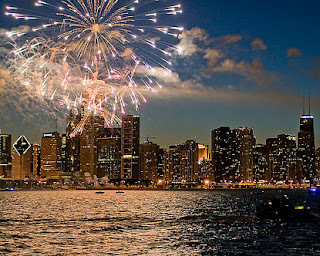 Taking place at the famed Navy Pier, Chicago promises 50 acres of shoreline and a pretty promenade awaiting your arrival. Fireworks are a definite, but guests will also find live music, shopping, two beaches, a Ferris Wheel and much more. Fireworks start at dusk so get there early to enjoy the food and fun. Stay at any of the Best Hotels in Chicago and know at the end of the day you can rest your weary head in luxury. If you are searching for an unforgettable way to celebrate the fourth, then head to Honolulu. 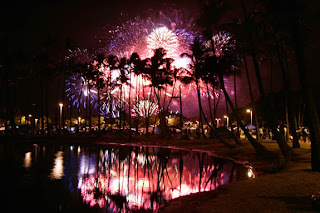 Here you can enjoy the tropical atmosphere as well as all of the fabulous American Fourth of July traditions. This capital city puts on a remarkable show with a Hawaiian twist. 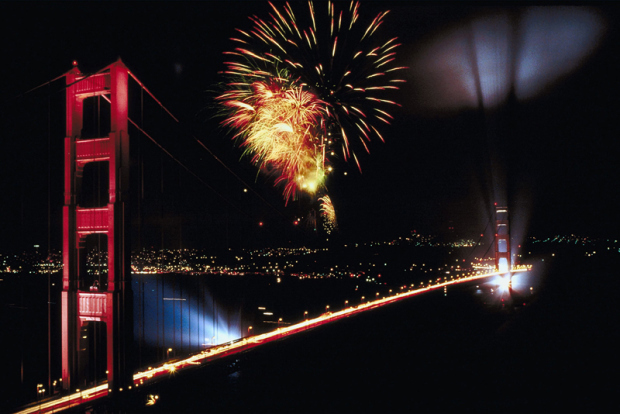 Celebrate all day but be ready to sit and take in the beauty of fireworks over the Pacific Ocean. Stay at one of the always elegant Hotels in Hawaii and find out why we are proud to have these islands as a part of our amazing country. Other amazing cities around the country promise a day filled with food and festivities. Check out Seattle for a laid back vibe, Charleston, South Carolina with a historic twist and of course New York City will put on a show that will knock your socks off. So as July gets closer, take a look around the country for locations that would ensure you have a phenomenal Fourth. It is truly a time to reflect on the greatness of our country and remember how we should all be proud to be Americans. Where is your happy place? It is probably safe to say that most people would put themselves in either an exotic location or a luxurious place. If you are in need of a place to dream about, or you're tired of dreaming and ready to start living, WhatAHotel! has a number of dazzling destinations that will fulfill your fantasies. Cobblestone streets and a historic city center are just a few fabulous characteristics of Prague. The Czech Republic may not have a reputation as famous as its neighbors, but this charming location is perfectly delightful. Upon arrival in Prague, a check in at the always phenomenal Mandarin Oriental Prague will ensure you feel like a VIP. This hotel is in close proximity to many of the landmarks in the city, although the impeccable service and amazing amenities will make you think twice about ever stepping foot outside the hotel doors. The architecture, decor and activities offered at the Mandarin Oriental Prague are superior and the on-site restaurant is simply divine. Head to the Mandarin Oriental Prague to experience a little piece of heaven. 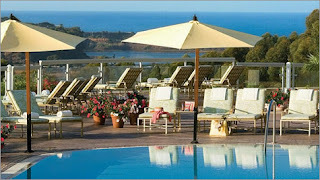 Our next dream destination fulfills many a desire and is located in easy to travel to Napa Valley. Locals say that Napa, California is the closest you can get to a trip to the Tuscan countryside without ever leaving the United States. The Carneros Inn is the perfect place to stay while you're in Napa. 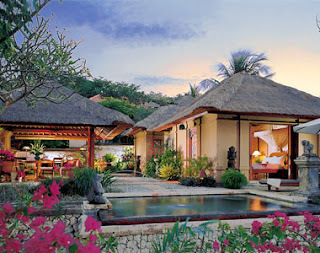 This intimate resort was created so that guests could experience the beauty of the surrounding land in complete luxury. The grounds are stunning showcasing barns, silos, cottages and an apple orchard. The food served is sensational and the spa treatments will prove relaxing. 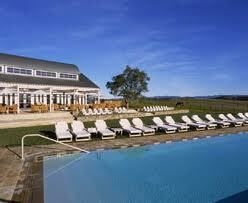 Think country chic and add a splash of California's best wine and you will discover The Carneros Inn. Our last locale might just be the definition of a dream destination. You have pristine white sand beaches, tropical breezes, azure blue waters and remarkable luxury at Mexico's Rosewood Mayakoba. Located on the Yucatan Peninsula, this resort showcases 128 suites and an over the water spa that specializes in treatments utilizing Mayan health rituals. The natural beauty of the surrounding area is captured in every elements in the resort. You will feel serene and relaxed in a true lap of luxury. This may just be one daydream that you hope you never wake up from. We all have dream destinations, but if you're lucky you may be able to enjoy that dream in real life. WhatAHotel! can assist you in finding a great resort or hotel, in a stunning location, that will make you wonder if you are awake. When you book with us you will receive exclusive complimentary perks and benefits that will only add to your perfect trip. Get ready to experience wonder and beauty in some of the most amazing accommodations and locations in the world. Work, schools and commitments can make life stressful and anyone can tell you that planning, and actually taking, a vacation can be a daunting task. We count down the days until we can get away from it all and enjoy some much needed downtime. These precious days away are truly cherished and so some travelers might find it difficult to decide on a vacation destination. Should you head to the beach and bask in the sun and sand or should you hit a city where culture and sophistication are easily found. Well worry no more, here are a few locations that give you the best of both worlds, skylines and shorelines, to ensure your vacation is unforgettable. This Swiss definitely do certain things right, they are a peaceful country, have delicious chocolates and even their army is trendy. But tourists looking to find vacation bliss can find just that in landlocked Zurich. Situated on the Limmat River and channel as well as a lake, this city may not be coastal but it does have an abundance of water nearby. There are 18 swimming areas throughout the city and each has a very different personality. Find the spot that best fits your mood and dive in. After a day by the water, guests of Zurich can stroll through the city streets to find delightful restaurants, scenic bars and great music venues. Stay at any of the Best Hotels in Zurich and hunker down for a fabulous get-away. It is quite obvious the draw that Italy has on many tourists. The history, culture, fashion and let's not forget the food, all easily attract guests. But Italy is also quite famous for its coastal beauty. The Amalfi Coast is a favorite place for Europeans to spend Holiday and tourists from around the world couldn't agree more. Enjoy the beautiful museums, sit alongside the cobblestone streets and sip espresso or bask in the sun and look across the sea, this Italian destination has it all. Stay at the gorgeous hotels and resorts on the Amalfi Coast and find exceptional service, remarkable amenities and spectacular decor. 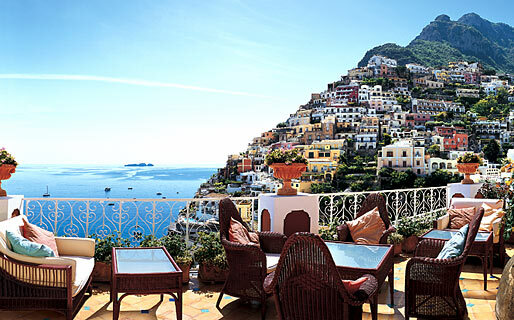 The views from the terraces alone will prove that the Amalfi Coast could not possibly disappoint. Barcelona and Madrid were once the best and most spectacular cities to visit in Spain, but today Valencia has stepped out of the shadows of these two amazing Spanish cities and impresses travelers on its own. The metro area has had a face-lift in the area of Arts and Science and today shows off with a beautiful planetarium, opera house and two museums. Also taking its reputation up a few notches was the city's privilege of hosting the 2007 America's Cup. This helped to transform the filthy and empty Mediterranean shoreline into a booming area. Now you can find hip restaurants and bars, new hotels and some exhilarating nightclubs. A visit to Valencia will showcase stunning architecture, breathtaking cathedrals, tapas restaurants and very chic shopping. Stay at the fabulous The Westin Valencia claiming to be one of the most impressive structures to date in the thriving city and find a travelers dream destination. These are just three amazing cities that offer guests the promise of big city life as well as coastal pleasure. Let WhatAHotel! help you book your stay in one of these remarkable locales, or any other great vacation destination, and receive exclusive complimentary perks and benefits that will inspire a very happy heart. Vacations are not to squandered but instead should be savored and fully enjoyed. Find the perfect place to spend your break from reality with the help of WhatAHotel!. There is something completely charming about a lighthouse. Whether it's the romantic notion of days gone by, the historic significance of some of the locations or just the classic beauty of the architecture, these beacons attract tons of tourists. Scattered all over America are literally hundreds of these iconic structures, either overlooking a vast ocean or tucked onto a rocky landmass on the banks of a lake or river. If these simple buildings have captured your attention, then let's take a peek at a few of the breathtakingly beautiful lighthouses that watch over the waters edge all over the United States. Hawaii is known for many things, but it isn't as popular for it's lighthouses. 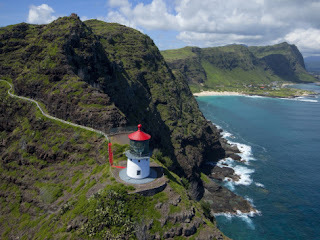 Located on Makapuu Point on Oahu tourists can find a trek that takes them on a tough hike up a steep path. At the halfway point there is a lookout that is the perfect place to be able to view one of the states islands. The red roof and white picket fence make it look charming while the rough and rocky terrain make it seem quite treacherous. The rugged beauty of the area is quite different then what you will find in nearby Honolulu. Stay at one of the Best Hotels in Honolulu and find chic boutiques, extravagant food and a posh atmosphere. The island of Kauai is the more natural of the Hawaiian Islands and so finding a lighthouse seems a bit more likely. 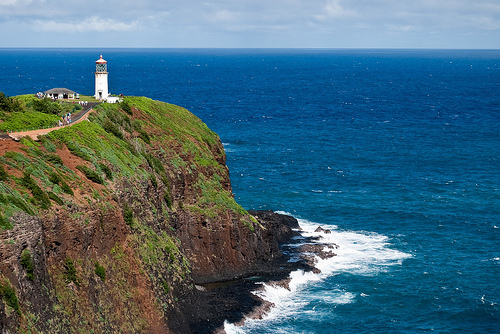 The Kilauea Lighthouse sits at the end of a looming cliff and can help to light up the night. Take a trek to the lighthouse during the day and enjoy spectacular views of the Pacific. If you plan to stay on Kauai, check out the always fabulous Four Seasons Hualalai, Kona where guests will discover unimaginable luxury and service. Hawaii may not be a state that comes to mind for beautiful lighthouses, but one look at what it has to offer and a trip to see the tall towers is a must. Michigan and Illinois may not hug the coast of an ocean, but Lake Michigan's size is large enough that it can seem like you are near the sea. All up and down the coast tourists can find stunning lighthouses, and if you look at some of the rivers that feed from the large lake, you can also find some beautiful lighthouses. 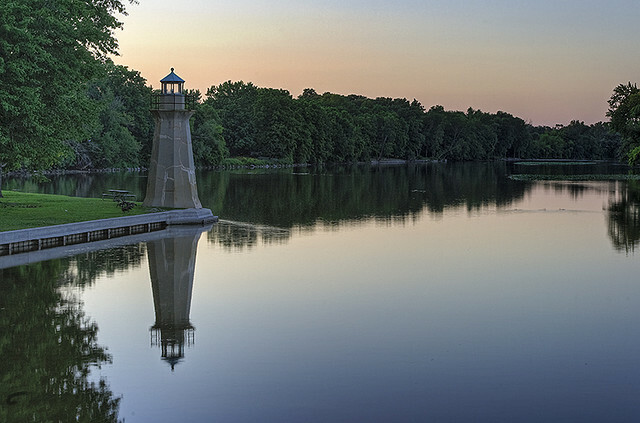 In Geneva, Illinois, a suburb of Chicago lighthouse lovers can find Fox River Lighthouse. 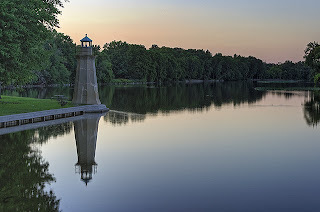 Sitting quietly on the shore of the river with the same name, this lighthouse is both unassuming and stunning. Surrounded by a thick crop of trees, a walking path and a pretty section of grass, this lighthouse is pretty all year round. Stay nearby in the fabulous city of Chicago and enjoy mid-western charm and big city style. WhatAHotel! is proud to offer some spectacular hotels in the Windy City that will make you feel truly pampered. The west coast has a few charming sites that include The Pigeon Point Lighthouse just south of San Francisco, Point Bonita Lighthouse near Sausalito, California, Heceta Head Lighthouse in Oregon and Patos Island Lighthouse on the San Juan Islands in Washington. A trip out west will no doubt showcase some stunning landscape with the quaint lighthouses keeping watch. The east coast is also home to some gorgeous lighthouses. Maine and Florida have some stunners as does North Carolina. If you decide to visit either coastal region, you will not be disappointed with the number and beauty of the lighthouses that call each coast home. If you find lighthouses intriguing, for whatever reason, the United States has a number of awe-inspiring locations that allow you to catch a glimpse of the structures and their past. Allow WhatAHotel! the chance to book your travel plans and know that not only will you be staying in a stunning hotel, but you can also receive exclusive complimentary perks and benefits that will set us apart from other online travel sites. Plan your getaway to some of America's most beautiful lighthouses and fall in love with their warmth, charm and beauty. Vacationers love their watersports. 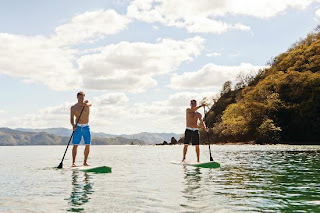 Snorkeling, scuba diving and surfing are all highly rated activities that tourists enjoy while on their beach vacation. One sport that has been around for a while but is just starting to surface as a main stream sport is stand up paddleboarding. It began in the 1960's in Hawaii as a way for locals to travel out on open waters and photograph tourists as they learned to surf. It has since grown in popularity. People of all ages are attempting to try out this enjoyable sport when they head ocean side. Because Hawaii is where this phenomenon began, there is no shortage of places that tourists can rent a board and paddle out for some fun. 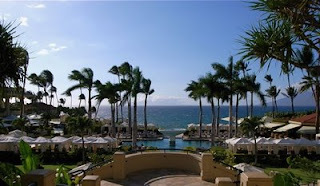 Four Seasons Maui at Wailea is a great place to stay during your time in Hawaii. 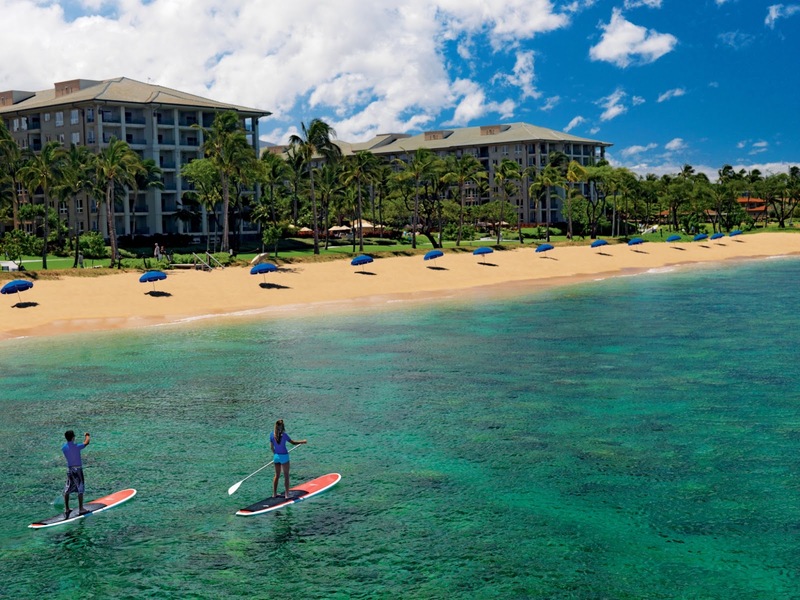 This luxurious resort has everything you could ever want and need while in Hawaii and you can be certain the the hotel staff would love to assist you in acquiring a paddleboard or help you find a paddleboard class. With prime location on the beach, you won't have to travel far to be oceanside. 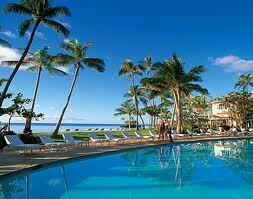 So let Four Seasons Maui at Wailea entice you to relax as well as play hard during your time in fabulous Hawaii. 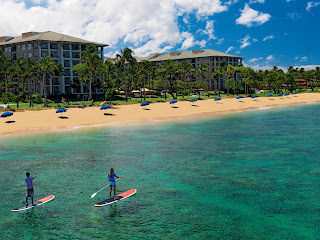 If you are thinking that a trip to Hawaii doesn't fit into your schedule, never fear, paddleboarding can be found in a plethora of other locations. Santa Barbara adopted the paddleboarding phenomenon when surfers realized it was a great way to spend time on the water when there weren't any waves. Santa Barbara harbor is the perfect place to set out to enjoy the sun and surf and happens to be one of California's popular paddleboarding areas. Stay at the beautiful Four Seasons Resort, Biltmore in Santa Barbara where they have paddleboards ready and waiting for adventurous guests. Another great locale is the Bahamas with 120 miles of island chains to explore. Stay at any of our Best Hotels in the Bahamas and find paradise. Other sunny settings include Costa Rica, Key West, and Mexico. For far less warm temps you could hit Whistler in Canada known to be a favorite for winter and summertime activities. Enjoy the beauty of the lakes in the area that are surrounded by the picturesque Rocky Mountains. Seattle is another paddleboarding hot spot due to it's accessibility to all things water. Capture the stunning views of the Seattle city skyline from the water and we promise that the experience will prove to be quite memorable. These are just a few prime locations that are great settings for paddleboarding. Water activities are a vacation must, and this one is great for every type of person. It is not difficult to learn but once you head out it is a great way to burn some calories, tour the area and hang with friends. Rent a board, take a class or even try some yoga moves, all aboard your stand up paddleboard. The country of Nicaragua is located in sunny Central America sandwiched between Honduras and Costa Rica. Many visitors that head to this beautiful country enjoy the colonial city of Granada, but tourists that focus only on this busy locale can miss out on the remarkable city of Rivas and the new and stunning resort that has just opened there. Enjoy Nicaragua's Emerald Coast and the town of Rivas where adventure and luxury awaits. Mukul Resort opened it's doors recently showcasing 37 guest rooms, each offering a secluded space and a unique style that compliments the natural surrounding of the resort. All of the breathtaking rooms offer spectacular views of the ocean as well as a private pool and terrace. The teak wood accents and cream colored interiors are calming to visitors and the ocean views and stellar service will create a fabulous feel to all that are lucky enough to stay here. Dine in style and taste the flavors of Nicaragua at the interior restaurant or go casual at the seafood restaurant overlooking the ocean. The on-site spa has a unique set of treatments using aromatherapy and medicinal plants and herbs so guests can relax and rejuvenate. Among the 4 miles of coastline that belong to the resort guests can find pristine beaches, fun watersports and even an 18-hold golf course. So getaway from the everyday and enjoy the extravagance that is Mukul Resort. The owners of the memorizing Mukul Resort strive to stay true to the community as well as the environment that surrounds the resort. The staff at the resort are more than happy to help guests enjoy the city and the people that live near the resort. Head to the nearby fishing village of Gigante for an authentic experience. Beachside restaurants are charming and the shops offer local wares that not only allow you to take a great gift home but also help support the community. The resort staff will also assist guests in finding interesting tours and ways to spend time in this amazing country. Although the beauty and amenities of Mukul Resort are sure to keep you entertained the entire time you stay with them, the amazing cities and countryside near the resort are spectacular enough to draw you out for an adventure. 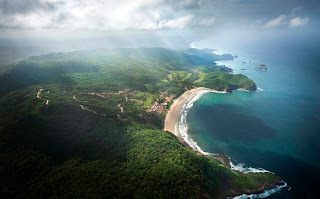 Nicaragua is a lovely country filled with a rich history, gorgeous architecture and awe-inspiring scenery. So if you are in need of a unique vacation destination, let WhatAHotel! 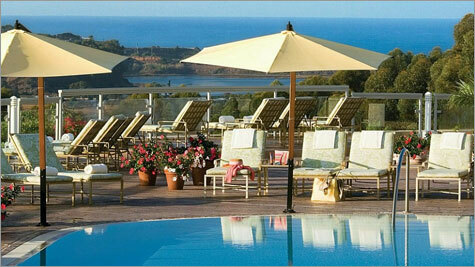 help you book your stay at Mukul Resort. We will not only assist you in booking your stay at Mukul, we also offer exclusive complimentary perks and benefits that will ensure you stay is truly spectacular. 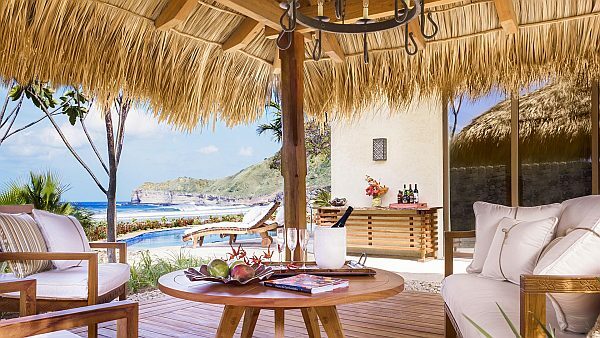 Travel to Nicaragua and enjoy a vacation unlike any other. There are few things in this world more stunning then the cathedrals and churches that were built centuries ago in Europe. Intricate architectural details, gorgeous stained glass windows and priceless art all help to create a simply magical place to visit. Although the US is quite young in comparison to our neighbors across the pond, we still are blessed with a few breathtaking churches that are definitely worth a visit. Of course New York City is filled with impressive architectural landmarks and so it comes as no surprise that there is a cathedral here reminiscent of old world Europe. Called The Cathedral Church of St. John the Divine, this Episcopalian church encompasses an entire city block and is tall enough to house the Statue of Liberty. The only church that is taller is St. Peter's Basilica in Vatican City. Made of Limestone and granite , this impressive church was first built in 1892. It was originally designed in Romanesque-Byzantine style, but after several fires and decades of wear, the church transformed into French-Gothic style. In addition to the massive cathedral comes 13 acres of pretty grounds for visitors to stroll through and if you are lucky you might spot one of the white peacocks that calls this site home. When traveling to New York City, WhatAHotel! can offer you a remarkable stay at one of the Best Hotels in New York City where you will receive perks and benefits to ensure a memorable visit. A trip to our nation's capital means countless monuments and landmarks that are simply stunning. Washington National Cathedral is not only beautiful but also has a very interesting past. It has been the site of 21 presidential funerals as well as a few funerals for famous national heroes. The design of this cathedral is Neo-Gothic with a limestone exterior, steep arches, flying buttresses and stained glass windows. It took 83 years to build and wasn't completed until 1990. Because of it's most recent finish, the designers actually put a sculpture of Darth Vader at the top of the west tower as a symbol of evil. Head to the Pilgrim Observation Gallery where visitors can catch a glimpse of a 360-view of Washington D.C. and the beauty of the surrounding area. A trip to Washington D.C. should require sophisticated accommodations, so let WhatAHotel! help you find one of the Best Hotels in Washington D.C. to allow for a fabulous nights sleep. There are other locations around the country that are also proud to showoff their architecturally significant churches. St. Mary of the Angels in Chicago was close to demolition when what some consider a miracle happened and today it remains standing in all of its glory. New Orleans also has a gorgeous cathedral in it's midst, the Cathedral-Basilica of St. Louis King of France overlooks Jackson Square and is our country's oldest continually used Catholic church. San Francisco has Grace Cathedral in Nob Hill that is reminiscent of Notre Dame in Paris and the exotic Hawaiian Islands have The Cathedral of Saint Andrew located in Honolulu that is Hawaii's first Gothic vaulted Cathedral. These are just a few phenomenal churches that prove although America may be young, it has a beautiful past that is filled with stunning architecture. Let WhatAHotel! assist you in finding the perfect hotel in a city that is proud of it's landmarks and churches. With the additional complimentary perks and benefits that you will receive when you book your travel with us, you will no doubt be pleased with your first-class accommodations in some of the Best Hotels in America. Some people swear that camping is the best way to spend quality time outdoors. Sleeping under the stars, cooking over an open fire and isolating yourself and your fellow campers from the outside world seems like paradise to nature lovers. There is another group of people however, that think camping consists of staying in a hotel without a 5-star restaurant and 1000 thread count sheets. If these two types of people just so happen to desire to take a vacation together, the difference could cause problems. But today there are a few hotels around the world that offer something called glamping, otherwise known as glamorous camping. 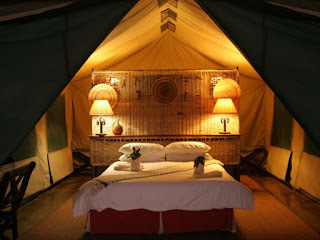 This seems to be the best of both worlds, tents under the stars and luxurious beds with plush pillows. Here are a list of beginner tips for those that think glamping might be perfect for them as well as a few of WhatAHotel! resorts that offer the perfect glamorous tents. 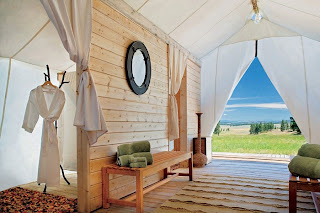 So before you venture out to experience the true idea of glamping you should understand a few things about it. First you have already read that the word is a combination of the word camping and glamour, so for a site to be both of these things it should give guests all of the comforts of a great hotel with easy access to the great outdoors. Second you need to understand that this experience is for a diverse number of people. It is a great vacation for honeymooners and can also be a great destination for families. And finally it is important to understand that these fabulous glamping sites are not just situated in one type of location. You can find these luxurious tents surrounded by grassy hills in a temperate climate or in the dry dessert sands. So select a location that best fits your mood and get ready to familiarize yourself with all the pleasure that exists when you explore the great outdoors. WhatAHotel! offers travelers spectacular benefits at the Best Hotels in the World. 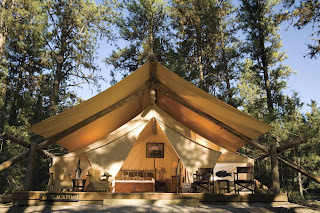 We are also proud to have a few resorts that can offer guests a great way to experience glamping first hand. Maun, Botswana is the first location in the exotic country of Africa. Eagle Island Camp has luxurious accommodations located on elevated wooden platforms. Here guests can enjoy the beauty of the African Okavango Delta while seeing the big game, lush vegetation and exotic birds. Our next exclusive location is in breathtaking Montana, where the weather might be a bit cooler then Africa but the glamping is just as fabulous. 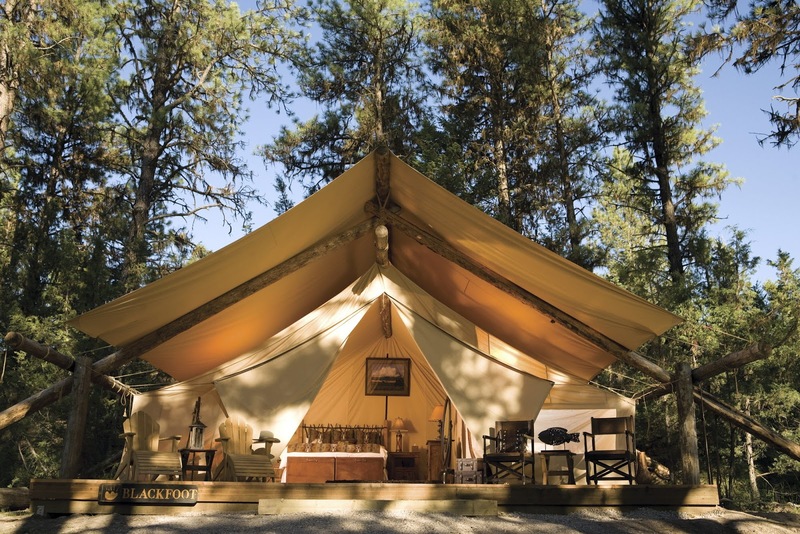 The Resort at Paws Up is tucked away in Greenough, Montana where the luxury tents have everything guests could ever want. The countryside is remarkable and the waters are crystal clear. These are just two options of what is available when it comes to the wonderful world of elegant camping. WhatAHotel! is proud to feature these two resorts that also offer exclusive complimentary perks and benefits that will absolutely set us apart from other online travel companies. So take a look at the wonderful world of camping mixed beautifully with the luxe world of haute hotels and get ready to become one with nature. Camping is quite exciting for some while others prefer to be pampered by a top-notch hotel. So why not enjoy both! Glamping has been growing in popularity most likely because it fulfills the desires of a large group of people. So this summer if you want to head out and see all the wonders that nature brings, but not be too far from a cozy bed and indoor plumbing, head to one of these amazing resorts. The wild awaits with lots of fresh air and room service. While some vacations require budget friendly travel plans, there are certain times that command a bit of a splurge. 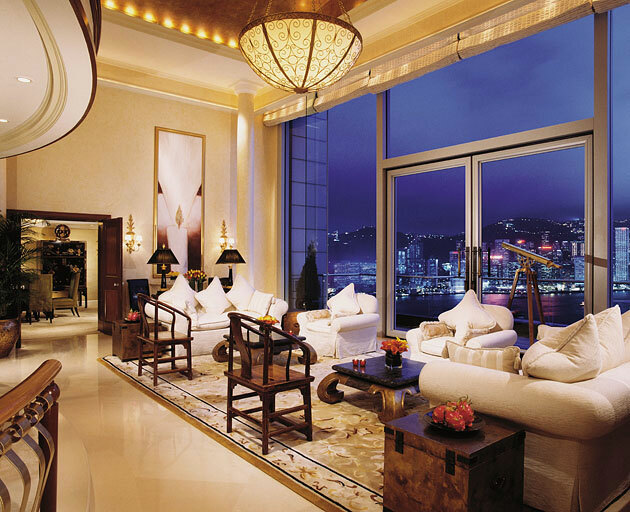 All over the world are unbelievably posh, and pricey, hotel suites that are fit for a king. If you are in the market for an over-the-top suite for either a special occasion or just because, look no further than these following amazing spaces. Get ready to stay in style with the help of WhatAHotel! Vienna is an astonishingly beautiful city filled with culture and old world charm. Here many hotels are housed in 100 year old buildings that are truly works of art. The lovely Hotel Bristol is one such site that opened its doors all the way back in 1892. 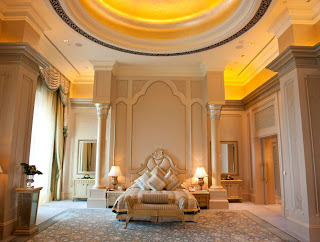 But what sets this hotel apart from many other hotels around the world is the suite called The Prince of Wales Suite. 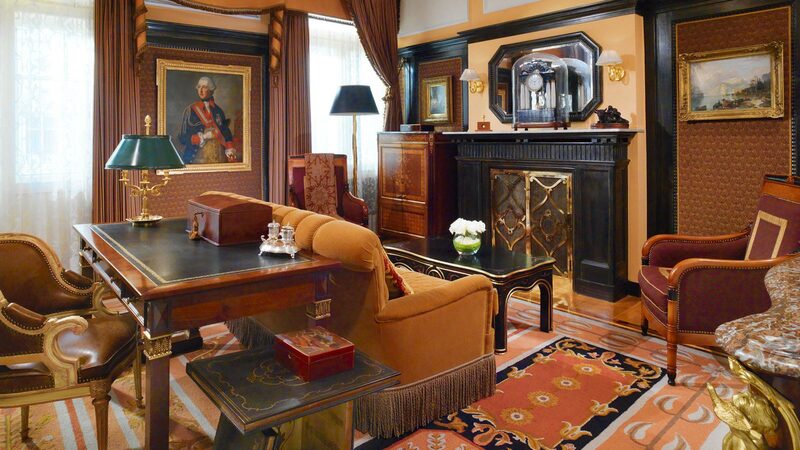 Named after royalty as well as fit for royalty, this suite is a one bedroom masterpiece. Spacious and masculine, it feels more like an aristocratic apartment then a hotel suite. It has two bathrooms and expensive antique furnishings that would make anyone swoon. For the right price you can sleep where movie stars and even the King of England once slept, now that's pretty swank digs. It will come as no surprise that Abu Dhabi is a very grand destination that welcomes the very rich, the very famous and even some royalty. 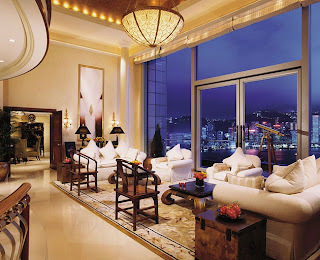 With regular visitors like this, it is a requirement for the hotels in the area to offer the ultimate in chic suites. The fairy tale palace come to life, Emirates Palace, creates an aura of style upon entering the glamorous gates. And inside this gorgeous hotel is not just one impressive luxury suite but 48. Called the Palace Suites, these rooms consist of one bedroom, high ceilings, an entry and sitting room as well as a palatial bathroom decked out in marble. 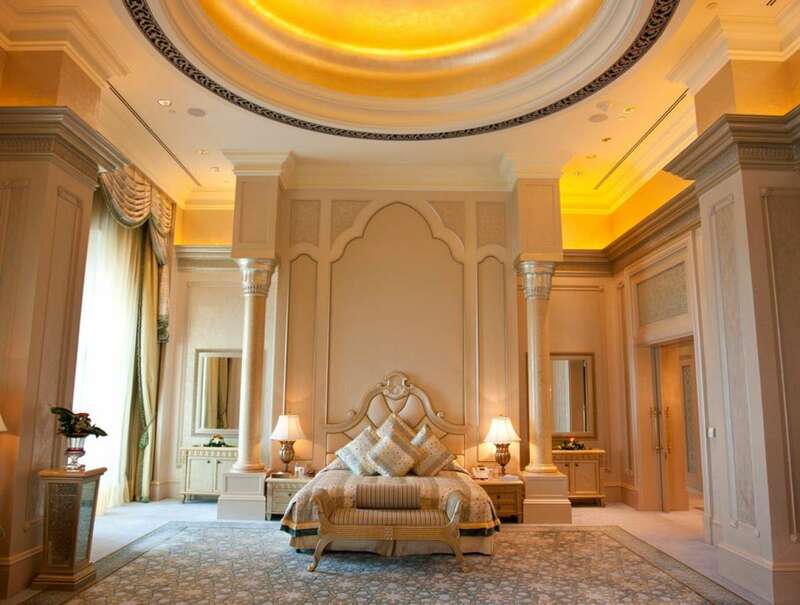 So if you travel to Abu Dhabi and want to feel like a VIP, check in at the Emirates Palace and stay in one of the Palace Suites. Awake your senses in the stunning setting that is Abu Dhabi. The next city with a number of top notch luxury suites is none other then Las Vegas. This city welcomes visitors of all social standings looking for an adventure filled vacation in a city full of excess. 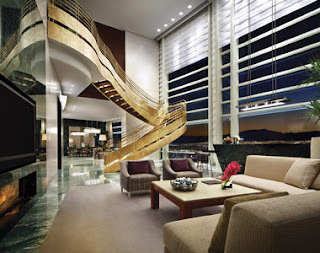 So hotels and resorts in Vegas want to provide guests with access to huge suites that are simply spectacular. Aria Resort and Casino is one such site and the Sky Villa 12 is a suite full of majesty. More like a big city apartment then a hotel suite, this three bedroom suite has 36 foot ceilings and floor to ceiling windows. The grand staircase makes the space breathtaking and the furnishings are modern perfection. If a trip to Vegas is in your future and you have a desire to sleep in deluxe accommodations, let WhatAhotel! help you book your stay in the beautiful Sky Villa 12. Lastly the ultra sophisticated city of New York has suites that are completely luxurious in every way. 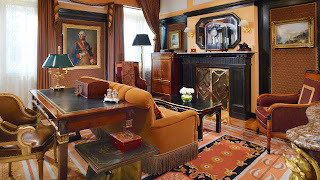 The Carlyle is a spectacular hotel that is overflowing with refinement. The Empire Suite here carries a large price tag and pretty fantastic amenities. Cashmere walls and a spiral suitcase envelope guests and the inspiring views of Central Park leave guests feeling like a superstar. As if that weren't impressive enough, the Metropolitan Museum of Art also organized a black and white photo gallery in the suite that are simply spectacular. High end suites are found at many hotels, but some hotels and resorts take the high end status up a notch. If you are wanting to travel and don't mind spending some serious cash to spend some time in stunning digs, check out these great suites. WhatAHotel! can help you book your stay and when you book your accommodations with us you will receive exclusive complimentary perks and benefits that will take your breath away. Spend the night in ultimate luxury at some of the most magnificent hotel suites around the world. Summer vacation has been a long standing tradition for many families and throughout the years the travel destinations may have changed but the entire meaning behind the trip has not; spending quality time as a family. Life can be crazy and filled with stress. Kids have become busier than in years past with homework, technology and extra-curricular activities and parents aren't much better. So as the summer months heat up and the days are getting longer, get ready to head out and enjoy a bit of fun-filled family time. WhatAHotel! is ready to present you with some pretty awesome vacation destinations that might just inspire some very fond vacation memories. It might seem a bit cliche, but the Grand Canyon is a phenomenal place to travel to with your family. The vast size of the rock formations is awe-inspiring and there is no way a picture can capture the magnificence of this classic American landmark. The multi-colored earth is gorgeous and the wide variety of activities while you're here will be sure to keep everyone extremely happy. 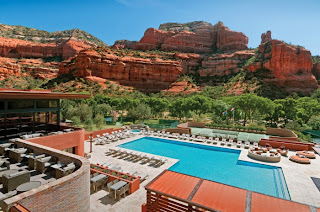 If you are dying to see the beauty and nature in the Grand Canyon but want to stay in a fabulous hotel that will pamper you, the incredible city of Sedona, Arizona is just a 2 hour drive away. Sedona is a tourist favorite and offers an unforgettable award-winning resort that promises a luxurious and family-friendly experience. 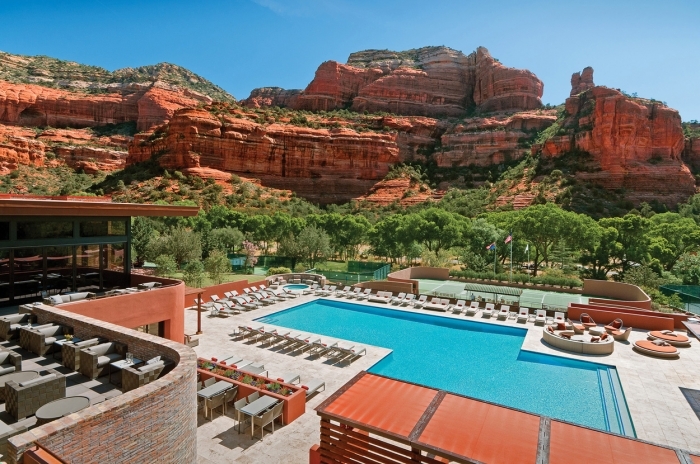 The Enchantment Resort and Mii amo Spa is a Native American inspired resort with rugged red rock formations surrounding it. Step one foot inside this gorgeous resort and spa and you might decide that you never want to leave. With activities on site for all ages, this lovely resort is ready to charm you and your family. So if the Grand Canyon and the surrounding areas seem to peak your interest this summer, know that WhatAHotel! can help you book a resort stay that will only enhance your family fun. There aren't many people that would complain about a family trip to Hawaii. This state is exotic and offers visitors a number of great educational and adventurous activities. The USS Arizona Memorial at Pearl Harbor is a great way to learn about history and the beaches of Honolulu promise to offer every water sport under the sun to ensure you'll never hear, "I'm bored". Visit the Volcano National Park and learn about science or head downtown for some chic shopping in the beautiful capital city. Stay at any of the Best Hotels in Honolulu and find all the exceptional beauty of the island wrapped up in amazing service and amenities offered by many of the top hotel groups in the world. California is a great state to visit in the summer. It's long coastline gives visitors access to beautiful beaches. Head to Santa Monica where families can enjoy wide sandy beaches and the beautiful waters of the Pacific without the crowds or cheesy tourist shops. San Diego is a great destination that promises southern California style as well as great golf, pristine beaches and the world famous San Diego Zoo. 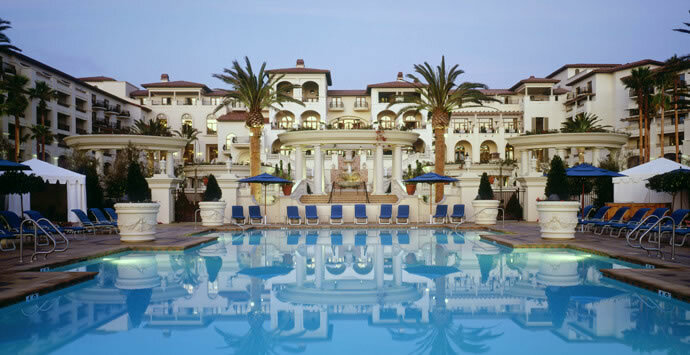 Other great cities exist in California, so if spending your summer on the west coast sounds like a fantastic family get-away, check in at any of the Best Hotels in California and get ready to enjoy a bit of laid back summer entertainment. These are just three ideas of great summer sites that are ready and willing to welcome your family this summer. WhatAHotel! has the inside scoop on great deals at the Best Resorts and Hotels that will engage and indulge you and your loved ones. When you book your stay with us you will receive exclusive complimentary perks and benefits that will only add to your already astounding trip. Summer isn't endless, so pack up your bags and get ready to spend some quality time with the ones you love in a place that you love.